Giving the public a special opportunity to experience the conversations that drive innovation at the university, this fall the UCLA School of the Arts and Architecture presents "10 Questions," a hybrid academic course and public event series that brings together leading minds from across the university to discuss ten fundamental questions. 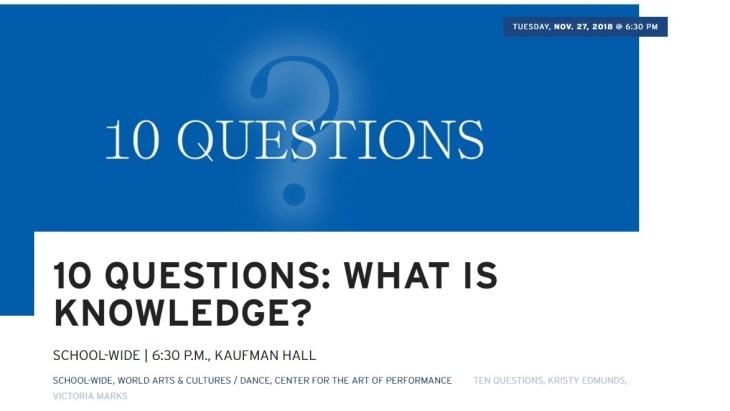 This week, Kristy Edmunds, Victoria Marks, Todd Presner, and Marcelo Suarez Orozco will join Brett Steele, dean of the UCLA School of the Arts & Architecture to explore the quesiton, "What is Knowledge?" Kaufman Hall is located in North Campus off of Sunset Boulevard. Pay-by-space parking is available in lot 4. One of the twelve prestigious professional schools at UCLA, the School of the Arts and Architecture offers leading programs in four degree-granting departments: Architecture and Urban Design, Art, Design | Media Arts and World Arts and Cultures/Dance, and one school-wide minor, the Visual and Performing Arts Education program (VAPAE). Our commitment to innovative education, pioneering research, dynamic public service, and community engagement is fueled by our unwavering belief in the fundamental value of creativity and the artist’s unique ability to change the world and shape the future.